JJC can design and test fixtures within the same week, with lower material waste and exceptional quality and precision. In order for aircraft to fly true, JJ Churchill (JJC) meticulously inspects every blade of its jet engine turbines. Their coordinate measurement machine (CMM) fixtures must maintain tight tolerances and deflect minimally in order to ensure a high level of accuracy. Markforged’s Onyx with continuous carbon fiber reinforcement is the only material that met their requirements of strength and stiffness at an affordable price. These printed parts exceeded all expectations held by JJC regarding part life on the shop floor. Manufacturing Engineer Karan Singh said, “once we realized the directional strength properties available with the Markforged products, we haven’t used anything else”. 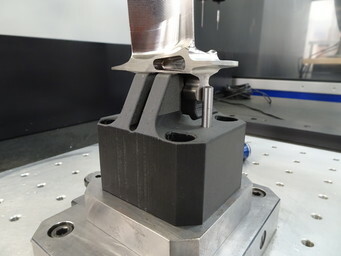 Traditional manufacturing of CMM fixtures involves multiple roughing and refining operations, which underlie slow iteration and machining wait times. JJC engineers constantly seek innovative solutions to such bottlenecks. They turned to Markforged to achieve major advancements in processes and materials. Combining custom additive manufacturing with off-the-shelf parts enables streamlined production and improved functionality. Ready to take the next step towards integrating additive manufacturing?